At first, Guillermo Del Toro (‘Pan’s Labyrinth‘, ‘HellBoy‘) was going to direct, but the studio was too scared to have him take the helm, which basically forced Peter Jackson to come back to the director’s chair, although he only wanted to serve as producer. Then came the news that the studio wanted to make ‘The Hobbit‘ into three movies for financial reasons. Now, ‘The Hobbit‘, written byJ.R.R Tolkien is only 320 pages long. The ‘LOTR‘ books were well over 1200 pages long combined. You can do the math yourself, but taking a small 320 page book and splitting it into three long movies is very difficult to get right. Well the end result was less than stellar. There was way too much filler, slow pacing, and everything just kind of fizzles out. With ‘Lord of the Rings‘, Jackson and his crew took their time and made three incredible films. They were milestones in the filmmaking world that paved the way for many other filmmakers over the last decade and a half. And even ‘Return of the King‘, the topper to the ‘LOTR‘ trilogy was such an epic and beautiful film that it won 11 Oscars. 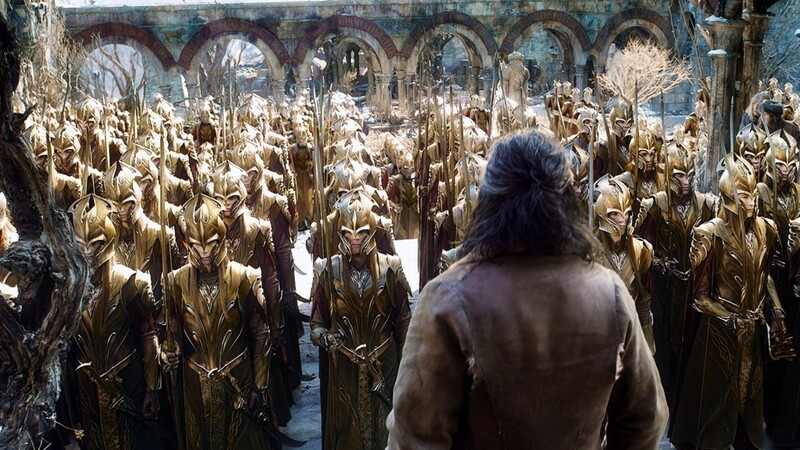 ‘The Hobbit: The Battle of the Five Armies’ comes with an impressive 1080p HD transfer and is presented in 2.40:1 aspect ratio. 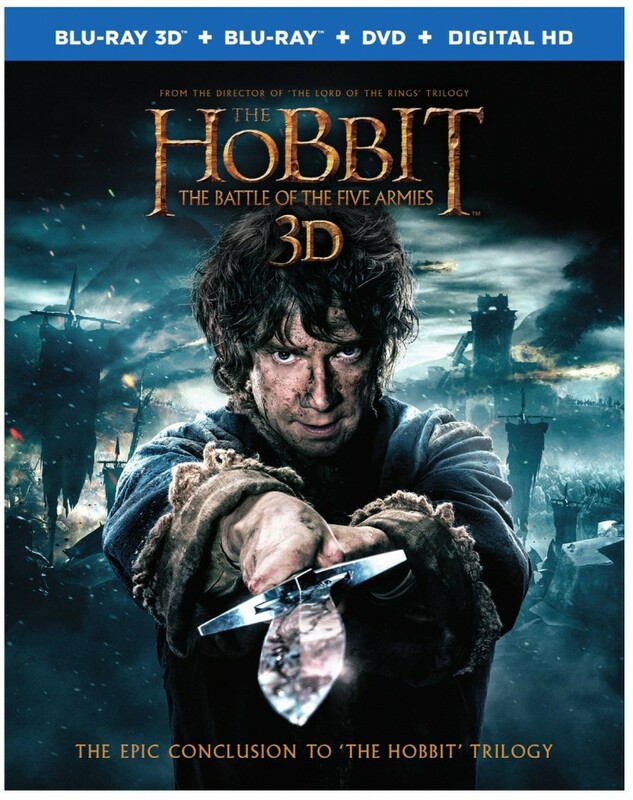 The 3D combo pack comes with both 3D and 2D versions of the film, which both of them look amazing. But the real winner here is the 3D version, which I thought I’d never say. The amount of depth and detail here is incredible and perfectly coincides with Peter Jackson’s previous ‘Hobbit’ films. The detail is extremely sharp and vivid at all times with very well defined closeups that reveal every scale on Smaug, each individual hair on the dwarf’s beards, every bead of sweat, perfect makeup effect, and bloody wound with great clarity. Wider shots do the same and not once did the image go soft or flat. Each background item, set piece or blade of grass shows up here. Colors pop off screen as well. When not in the sun or in the middle of a dragon attack, the color palette is rather dull with more grays, blues, and dark greens than anything. However, when we are in the sun, there are much more warmer and natural tones to the film, but both palettes look great throughout and are perfectly balanced and saturated. The 3D looks mighty impressive and might be one of the better 3D experiences you’ll have, so I highly suggest you choose that option. The 3D allows you to notice and see things clearly that you wouldn’t be able to before, such as dead bodies in the background, more orcs who are bloodthirsty man flesh, and detailed set pieces. There was some very minor sequences with crush as well as a few digital color grading issues, but it’s nothing that will hinder your viewing experience. Black levels are deep and inky always, and the skin tones are natural and smooth. There were also not instances of any compression issues such as banding, aliasing, or artifacts that showed up, leaving this video presentation highly recommended! This release comes with a badass lossless DTS-HD 7.1 audio mix and sounds awesome. Your speaker system will get a great workout with this audio track. Every sound is perfectly layered, well balanced, robust, and loud. The dragon’s fire-breathing roar is ferocious, the growls of the orcs are fierce, and the arrows flying through the air are swift and smooth. Every sword clank, punch, kick, and fantasy animal noise sounds amazing. The directionality here is flawless and the sound effects are all full and energetic, all of which pack a powerful punch. The rear speakers are always flowing with sound and noises, which fully immerses you in Middle Earth. Dialogue is always crystal clear and easy to follow, and free of any pops, cracks, and hissing. The bass has a very healthy rumble to it and will rattle your bones during the heavier action scenes. The score always adds to each emotion and suspenseful moment in the film. The LFE is perfect and the dynamic range is extremely wide, leaving this one of the better audio tracks of the year so far. New Zealand: Home of Middle Earth Part 3 (HD, 6 Mins.) – In an ongoing series on the previous two Blu-ray releases, this third and final extra covers the actual locations in New Zealand that were used to film the wars. Recruiting The Five Armies (HD, 12 Mins.) – This is an awesome extra where we see all the extras for the battle scenes suite up in the cool armor and costumes, rehearse their battle moves, and eat lunch. We even see some of the stunts. Great watch here. Completing Middle Earth: A Six Part Saga (HD, 10 Mins.) – Peter Jackson discusses the key ingredient to completing this trilogy as well as the piece that tied this and ‘The Lord of the Rings’ together. Completing Middle Earth: A Seventeen Year Journey (HD, 9 Mins.) – Here we have Peter Jackson and his talented filmmakers and co-workers talk about spending almost two decades making Tolkien inspired films. The Last Goodbye: Behind the Scenes (HD, 11 Mins.) – Peter Jackson, Philippa Boyens, and a few others discuss the end credit song by Billy Boyd. Music Video (HD, 4 Mins.) – ‘The Last Goodbye’ music video with Billy Boyd. Trailers (HD, 4 Mins.) – A couple of trailers for the film. 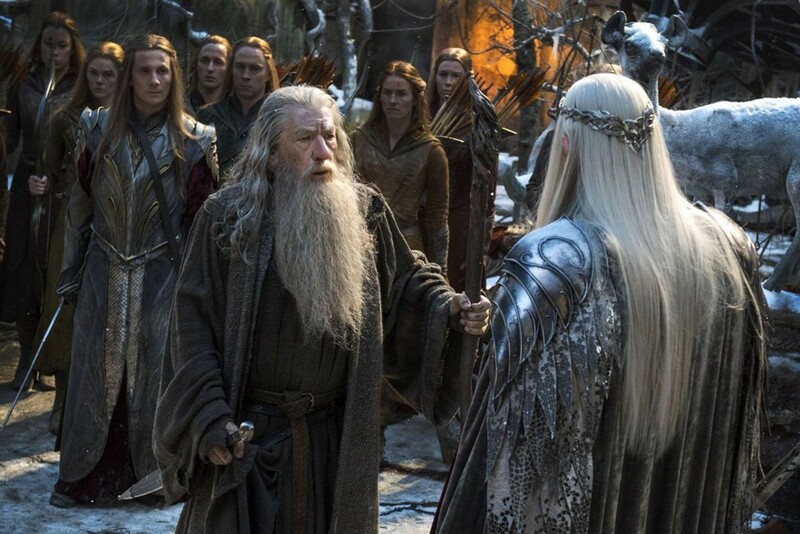 ‘The Hobbit: The Battle of the Five Armies’ might not be the best film, nor does it even compare the greatness of the original ‘Lord of the Rings’ trilogy, but it has a few moments to love, and is the key link between this trilogy and the latter. I however wish this could have had the impact the ‘Lord of the Rings’ had on me. But one thing is for sure, the video and audio presentations are both demo worthy and the extras are all worth watching. I do have a feeling though that in the next year or two, Jackson and company will release extended limited edition versions of these films separately and in a giftset, so don’t don’t expect for this to be the last time you see these on home video. That being said, this release comes highly recommended, despite my thoughts on the film itself. This entry was posted on Thursday, March 26th, 2015 at 10:58 am	and is filed under Film, News. You can follow any responses to this entry through the RSS 2.0 feed. You can skip to the end and leave a response. Pinging is currently not allowed. « Film Review: ‘Danny Collins’!